Thanks for your kind words, Richard. This a very good review. While I don’t necessarily agree with all your criticisms, I do recognize that they are valid (at least to you). Except in regards to the canon issues. You have a tendency to make a mistake that many do when discussing such things, which is assuming that when a new piece of information is retconned into the timeline, it can’t be resolved because it was never brought up, mentioned, etc. You did it last week with the time crystals on Borath, assuming that because they existed, Worf automatically knew everything about them, and thus would immediately go running back to Borath to use them to bring Jadzia back to life. But, just because Worf was on Borath doesn’t mean he was shown the crystals at all. Just because you went on the White House tour doesn’t mean you sat in on a meeting in the Oval Office. And so it is this week. In Sarek, Sybok is never mentioned either in that sequence, and the writers had the benefit of knowing he existed! As for the spore drive, there are reasons-a-plenty for them not to use it once Discovery is done, one way or the other. The simple fact that Stamets would be allowed to take a post anywhere other than Discovery shows that they did not intend to keep using it. That’s the thing, Dave, it’s not credible. If Starfleet knew it had the ability to traverse hundreds of thousands of light-years in the blink of an eye, they would certainly pursue it at all costs. It might take years or decades or even centuries, but if mankind knew there was a cure for cancer or a way to eliminate famine, you’d better believe someone (likely many someones) would be pursuing it until they found the hidden solutions. If Starfleet weren’t doing this kind of research on spore technology, it needs to be explained to us why. Now, for a little portion of this season, it sounded like the Discovery going through the mycelial network was damaging the home dimension of the mushrooms. So that would have been a good reason not to boldly go there. But even AFTER the whole Mushroom May plot, the Discovery is still zipping its way from point A to point B using shortcut M. So obviously, Starfleet doesn’t seem to have a problem with spore jumps. As for the time crystals (which were NOT mentioned in Voyager “Endgame” by the way; I checked), the fact is that the time crystals were known about “in legend” throughout the Klingon Empire, but many Klingons seemed to know they were real–including Voq/Tyler, L’Rell, and whoever ordered the Klingons to experiment with the time crystals before and during the war. So the odds are that Worf would at least suspect the crystals might be real. If so, then he’d at least attempt to find out for certain in order to try to save Jadzia…who wouldn’t have died had she simply not been in the wrong place at the wrong time. Now of course, the real reason Worf didn’t seek out the time crystals is because, at the time, there was no such thing as a “time crystal” in the Star Trek universe. That’s also why Sarek never mentioned Michael Burnham. (The reason he didn’t mention Sybok is that Sarek never had any regrets about his interactions with his elder son. Sybok was just a black sheep from day one.) But that’a the risk of doing a prequel–you run into a lot of places where you can introduce something that royally screws up established continuity. Now, if it’s small stuff, like a Klingon soldier gets killed or Saru invents a new kind of cheese, no big deal. But when you introduce technology that can allow your ship to travel instantaneously to anywhere in the known universe or giving the Klingons the potential power over time itself, then it’s a big thing, sir. A detail, at the end of the chapter we see the distribution of the ships before the battle and the phrase “we are surrounded” is heard; I sincerely remembered The Wrath of Khan and the lack of combat experience in three dimensions. Another point, I do not know if they noticed that the ships leaving the warp pass at zero speed? That is a detail that began to be seen in the films of JJ Abrams. I just imagined ST:D with Norman Lovett doing the ship’s computer voice. If Burnham’s mother is somehow successful at removing Micheal and her husband from the station before the Klingon attack, it would remove her from Spock’s life, but would alter the timeline so she wouldn’t be on Discovery in the first place! If they had it happen after the Discovery is flung into the future, they could invoke some crystal mumbo jumbo that makes Discovery impervious to causality! Yup – with you all the way on that one Jonathan, and liked the HitchHikers references. Not so keen on the rather unlikely ship-to-ship walkways. However, I did love the Enterprise sets – some fantastic detail there. Little things like the grilles in the corridors and the offset turbolift. Did they really splash out on all of that for just two episodes? 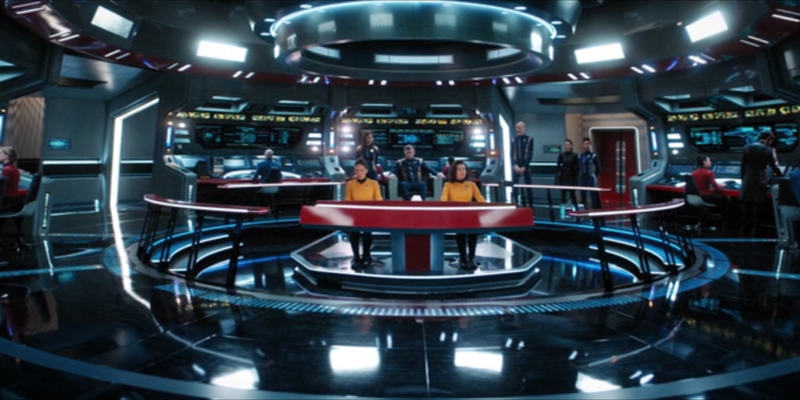 Kinda suggests we’ll see more of the Enterprise in the future, unless it was GCI trickery or an end-of-season splurge with the budget. I’m not sure how the next series will unfold. If the volunteer crew is indeed meant to adventure through time, Doctor Who style (please, no), then it’s an awfully big ship for just a handful of people to operate. And that’s assuming they’d have time to actually do anything at all with all the inevitable touchy-feely group-hugging and speechmaking that seems to be going on lately. Jonathan, I always enjoy your reviews. I don’t always agree with some of what you write but I do find them informative and entertaining. I consider what you write to be pretty darn unbiased and good reading. Thanks for putting the time and effort into an excellent blog. Thanks, Bill. Comments like yours make it all worth it…really! 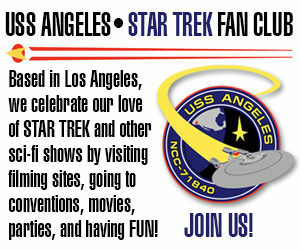 Previous Previous post: Can the Klingons help AVALON get $500 in donations in 4 days??? Next Next post: WARP 66 STUDIOS expands its TOS sets…with the help of JOSH IRWIN from Avalon!